Introducing Alexandra Vlachos Grünig, a PhD candidate in the Department of History at the University of Bern, Switzerland, where she is currently working under Prof. Christian Rohr. The Swiss National Science Foundation (SNSF) has just granted Alexandra a 3-year full scholarship for her doctoral studies. Previously, she studied contemporary history (19/20th century), Egyptology and journalism at the University of Fribourg, Switzerland. During those studies, she mainly focused on the cold war, US foreign affairs, the Swiss political system, and the global and European history of ethnic cleansing. Alexandra is very keen to correspond with Canadians about her research, so if her work interests you, please get in touch with her. I have spent this summer on Haida Gwaii, learning and discovering the seemingly endless different views about the cedar tree, talking to cavers, loggers, chiefs, museum curators etc., exploring the Islands from the very north to the south tip down in Gwaii Haanas National Park Reserve (the first conjointly managed park of BC government and the Haida Nation – mainly a result of anti-logging protests on Lyell Island in the 1980ies). Even though cedar has a rough time to grow back due to introduced sitka deer and badly managed logging, it is still very present on Haida Gwaii in many different ways. Western Red Cedar (Thuja plicata) is easy to distinguish from any other tree of British Columbia. Its bark is different, its needles are soft and its smell is unique. 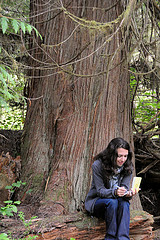 Old growth cedar is an essential part of BC’s coastal rainforest and is closely connected to healthy salmon streams. In second growth forests, it usually grows after other conifers like spruce and hemlock, because it needs shadow and wet soil. There are surprising facts on the Thuja plicata: first of all, it is not a real cedar, but a cypress. This tree produces thujaplicin, its own defensive mechanism against rotting and fungus. This natural fungicide enables even a long gone dead tree to still be a valuable part of the rainforest. Red cedars make excellent nursing logs and everything that is produced from its wood will reliably resist rain and salt water. For this reason, cedar was and still is the foundation of the culture and art of BC’s coastal First Nations. Literally every essential part of their material (and supernatural) world depended on cedar wood: longhouses, canoes, paddles, totem poles, hats, bowls, clothing… It is for the same reasons, that cedar wood today is a sought after wood for the timber market: The light timber is the perfect wood not only for shingles, but for everything exterior facing from garden furniture to entire houses. Together with its beautiful appearance, it makes red cedar a commercial valuable product – but only if it has grown to certain dimensions. After extensive logging in the 20th century, old growth cedar is becoming more and more rare on Haida Gwaii. It is not too hard to sense a highly sensitive political issue here: The Haida claim red cedar as an existential resource not only for their art, but for their heritage and culture. Timber companies value cedar as a commercial product that makes big money. The BC government – involved in several negotiations with the Haida around land use and ownership – has its own interests in the management of natural resources. My dissertation project is all about a “biography” of the cedar tree, aiming to analyse the conflicts around it with the tree itself in the center of the study. I use more of a cultural approach than intending to write a “traditional forest history” of Haida Gwaii. With the theoretical background of the cultural history of Jan Assmann and the Actor-Network-Theory of the French sociologist Bruno Latour, the main goal is to detect the different attitudes and emotions around the cedar tree. It is about the memories of fallers and loggers as it is about the point of view of a Haida carver. It is not so much about “hard facts”, than it is about stories, about memories, about emotions. It is a multi-disciplinary project focusing not only on archival sources, but also on diaries, photographs, stories, objects and oral history.